I've paid for the Akra as I got a good price also it looks a little better IMO. Sound-wise you get a less "tin can" type of sound for a lower toned resonant sound. When removing the dB which makes little noise difference you get a bit more of the same tone. However on the XR the air box takes most of the soundtrack to the rider. Compared to the R where the air box hurls a lot less so the exhaust is recognizable. Now you have other options to compare problem is that YT don't let one have a better sound quality on the clips so it is not noticeable the difference. Was talking to a guy with an Akra on a S1XR last week and asked him to start it, have too say a much nicer deeper tone and not really any louder. But bloody hell it's pig ugly imo even uglier than the standard can and that's bloody awful. Would like a deeper tone on mine but could never justify the cost of an Akra plus I don't like the look of it. 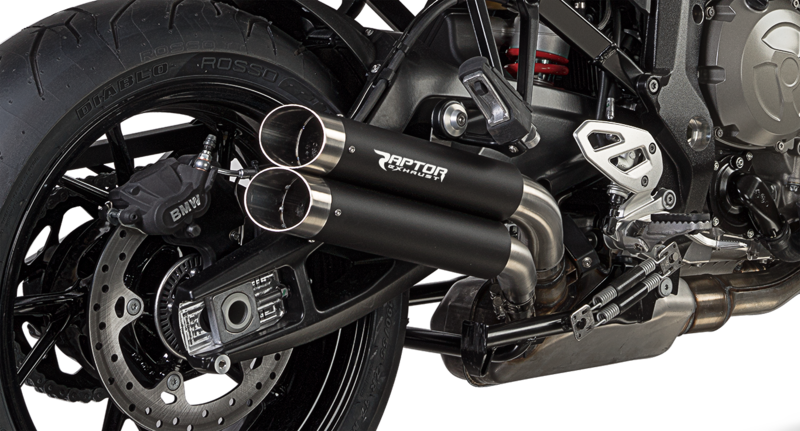 Try the BOS exhaust. I had one in my S1KR. Reading the post here about it seems it has less resonance and if packed similar like the one I had you might find a better low tone sound off it. It is slimmer and probably they have two finishes. Or the LeoVince i did liked that too from what I could see and hear, they have a black version as well. If your is Euro 3 or if in your country law on noise or pollution is meaningless then you can do that for a euro 4 one. I also looked at Mivv but sounded the same as stock to me. These Cobra's sound very nice to me. Would like to hear it passing by with higher rpm. I'm glad I'm not the only one who put my rim stripes on wrong. I've got these Raptor's coming from Germany, hopefully they'll sound like the Cobra's. Been searching for months to find an alternative to the big, heavy ugly OEM can. And sorry to say, I don't like the Akra - on looks or price. Have found very few makers who do a slip-on for the XR. The only one I liked was the Cobra / Raptor and finally Pipewerx.com decided to make one to fit. There are one or two others, but they didn't appeal. Nearly bought the Cobra, then my son found BOS and for my taste it fits the bill. Compared with the OEM it's smaller, much lighter, beautifully engineered, shorter, slightly conical rather than same dia and carbonised!! No removable baffles, but it makes a richer and slightly deeper sound - and it pops nicely on the down-shift. I think it suits the scale of the bike too!! See for yourself.